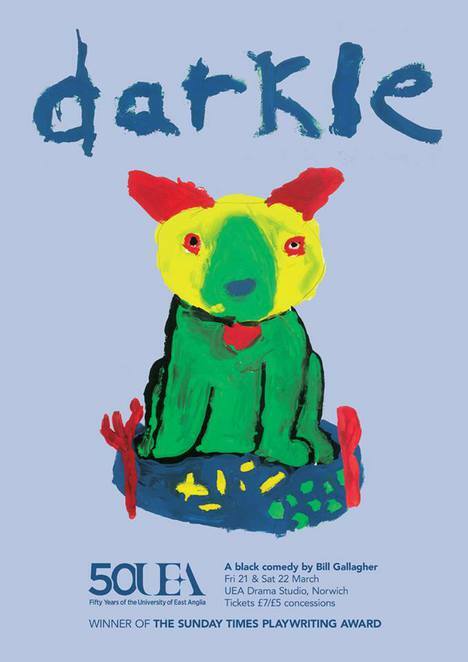 From acclaimed British film and TV writer Bill Gallagher (The Paradise, Out of the Blue and Conviction) comes the black comedy Darkle, which is bound to fuel discussions afterwards and provoke some thought and argument with its dark humour and disquieting moments. Gallagher exploits the 'would have/could have/should have, which may disgust some and spur energetic discussion with others. In this quirky and disturbing play, three young bored flatmates, Kat, Emma and Brian, are set on instigating fun and mischief at the expense of others. Their landlord, Mr Stringer and his dog, Max, are their only interactions. Stringer is obviously a lonely man craving their company. When he is not chasing them for their overdue rent, he appears unannounced and passionately talks at length about tragic events sensationalised in the local tabloids. The three young tenants find their child-like quirky antics in the past now lack excitement and appear boring. They decide to teach him a lesson and do something even more fantastic, they kidnap Max, the dog. Despite the flatmates lack of endearing qualities, some members of the audience judging by their laughter found the flatmates fantasies and mischievous antics funny. For other audience members what eventuates is sinister, spiteful and utterly repulsive and requires them to suspend beliefs as they form different interpretations concerning the outcome. The entire cast Kat Jade, Emma Bagery, Tom Russell and Dave MacGillivay provide powerful performances. Even the appearance of a live dog offers a fine performance. Even though the play is finely played and has some wonderful moments, it surely shows how a simple prank can go too far resulting in tragic and sinister consequences. Although it is bound to hold your attention, for some it will suffer from not having a sound conclusion.